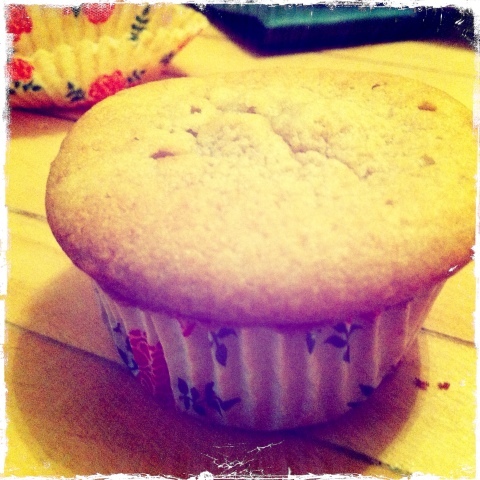 Home » Life » Banana Buns – yum yum! Banana Buns – yum yum! We absolutely love Banana Pancakes in this house – we usually make them one or two Saturdays a month, and they never last long. We’re also big fans of fairy cakes (or buns as we always called them growing up), especially lately because Little Man is now able to flick the switch to turn on the mixer! And he’s a dab hand at helping to lay out the bun cases in the baking tray, and scrape the mixture off the spoon and into the cases. Making them couldn’t be easier – throw everything except the banana and the fromage frais into a mixing bowl, and mix it until it forms a smooth mixture. Then add the banana and fromage frais and repeat! Then spoon the mixture into bun cases – it should make 12. Bake for 12-15 minutes at 190C until they have risen completely and are golden brown. And the verdict for our experiment – “Deeee-licious” according to Little Man! I thought they were pretty delicious as well – slightly crunchy on top, and soft and spongy in the middle. We’ll definitely be repeating this particular experiment!